Thank you for your interest in the soccerloco affiliate program. We are always looking for partners interested in helping us sell authentic soccer gear from the game's leading brands. Our soccer affiliate program provides an easy way for website owners to earn money by placing banners and other links on their site. Once the links are in place, our affiliate provider Shareasale tracks the clicks and pays a commission everytime those clicks lead to a sale on soccerloco.com. Free to join - There are no fees to be a part of our affiliate program. Easy to setup - Add links/banners to your website and earn a commission everytime your referral makes a purchase. 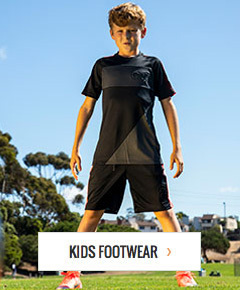 Work with a leading brand - soccerloco is a trusted brand in the soccer community known for our product selection and customer service. Powerful reporting - Reports in our system tell you which ads are most effective so you can optimize your promotional efforts. The soccerloco affiliate program is one of the most lucrative in soccer. All affiliates start at 8%, but can earn their way up to 10% of every sale based on performance bonuses. 30 day referral period - If a visitor to your site makes a purchase within 30 days of their initial click, you earn a commission. Unlimited referrals - Drive as much traffic as you can. There is no limited on the number of commissions you can earn. $120 average order value - Earn $9+ on an average sale. Getting started with the soccerloco Affiliate Program is easy. The steps below will walk you through the simple process of creating an account, requesting admission to our program and adding links to your website. To get started in our soccer affilite program, you will need to create an account on Shareasale (if you don't already have one). Shareasale is one of the largest and most trusted affiliate networks in the world. We use their platform to manage our affiliate program. Select your country and enter information about your website. Provide your email address to verify your website and be approved by Shareasale. Provide your contact and payment information before submitting your application. Once approved, you will receive a welcome email more details about our program. 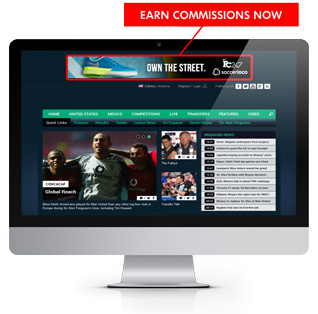 To begin earning commissions, you will need to add links and banners to your site. Your Shareasale account includes a library of creative materials which should be used on your site to attract visitors looking to buy. Once a visitor clicks on one of the ads, they are tracked onto soccerloco.com and you are awarded a commission if they make a purchase. There are a few ways to link to soccerloco.com which are explaind below. soccerloco provides a wide variety of banners and text links which are updated on a regular basis. Creative provided by brands like Nike, adidas, Puma and others is made available in accordance with related product releases. Less specific, soccerloco branded banners are also available. Login to your Commission Junction account. Click Get Links in the green navigation bar. Search soccerloco in the search bar. Click View Links in the advertiser column next to soccerloco. Scroll down or use the Additional Search Options filters at the bottom to find your desired link. Select your link options and then copy the link code from the box titled code. Don't see a banner that fits what you are looking to do? Contact us and we'll work with you to create custom creative around your subject that fits your design specs. Once you get signed up and ready to promote, we are here to help you. Whether you can't figure out how to link something or need custom creative, don't hesitate to contact us. Commission Junction also has a knowledge base with answers to general questions about the affiliate platform. To contact the soccerloco affiliate team, email affiliate@soccerloco.com or call 858-430-0476.